The California Condor is one of the largest birds in North America. From wing tip to wing tip, it measures 9.5 feet. That is just a little shorter than the standard height for a basketball hoop! In 1982, only 22 California Condors were left in the world. With the help of biologists, they now number over 400, with more than half flying free in the wild. As one of the longest-living raptors in the world, condors may live to be 50 years old or more. There is no difference in the physical appearance between male and female condors. 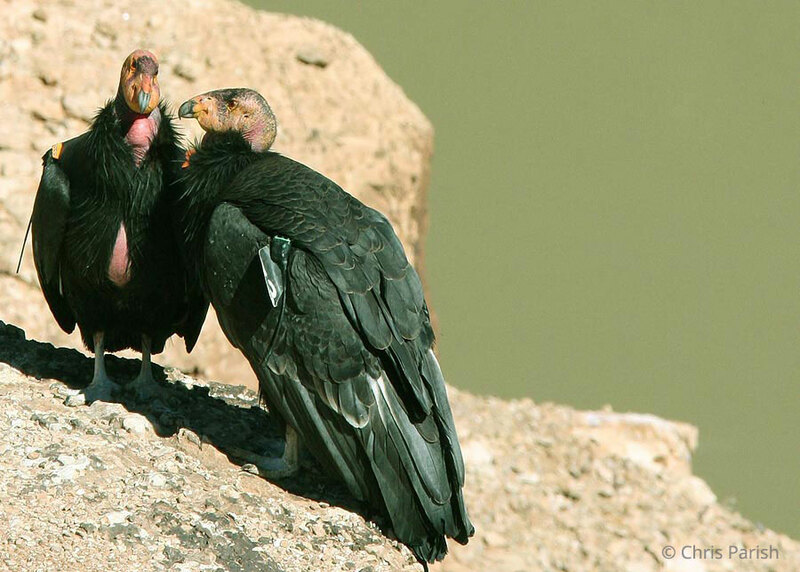 Lead poisoning is the main threat to the survival of California Condors. 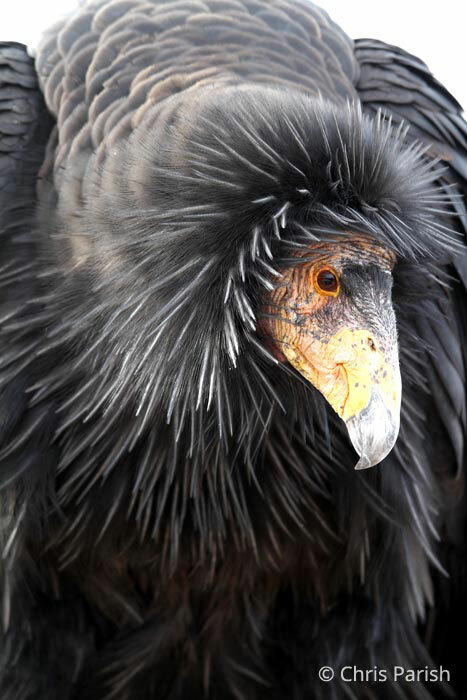 The California Condor is critically endangered, which means it is at a very high risk for going extinct in the wild. The Peregrine Fund, along with other organizations, has been working hard to make sure that this doesn’t happen. 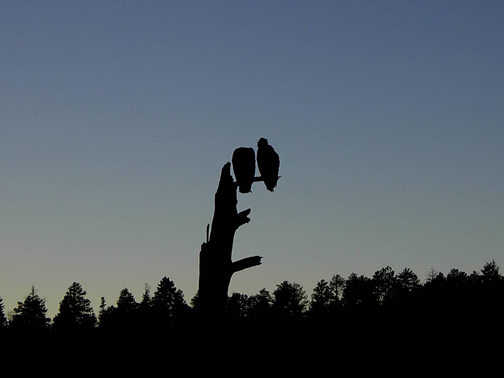 The Peregrine Fund began working with the California Condor in 1993. 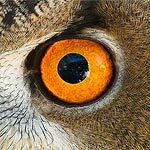 At that time, the organization expanded the captive breeding program for this species at the Idaho-based World Center for Birds of Prey, which continues to produce condors each year. There, each adult pair lives in a large chamber with lots of perches, good food, sunlight and a nest box. It is important for the adults to feel comfortable so that they will lay eggs. When condor chicks hatch at the World Center for Birds of Prey, they are raised by their parents for the first 5-6 months of life. Then they are placed in a large flight pen with other young condors where they learn to fly and interact with each other. 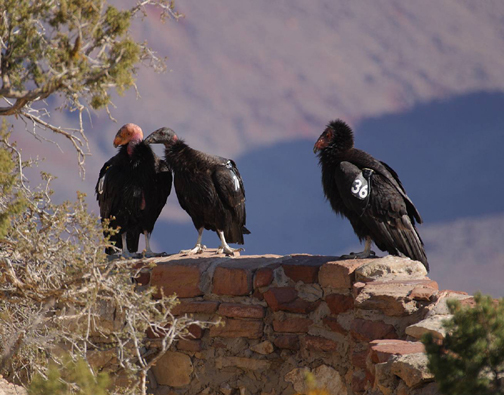 When they are ready for the wild, they are taken to the release site in Arizona and held in a large pen with other condors for a period of time. Here, the young condors adjust to the sights and sounds of their new home, and they begin to feel safe there. After they have been set free, they continue to return to the release site for food that the biologists provide. After a while, the young condors begin to travel farther and farther in search of their own food, and finally, live on their own. Each released bird has a numbered wing tag. 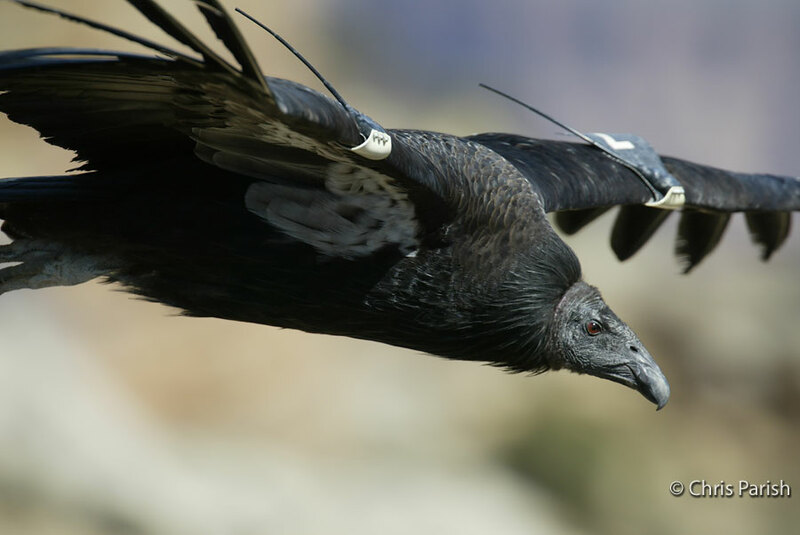 Because condors all look very similar, this tag allows biologists to identify each bird. Biologists also place one radio transmitter on one wing of each condor. The transmitters send out signals that biologists can detect with special equipment. 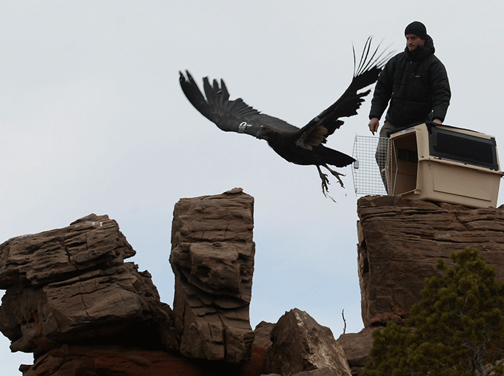 This helps them locate each condor to make sure it is healthy and finding food and to learn about its behavior. They also can find out if a bird is nesting – and many have been! 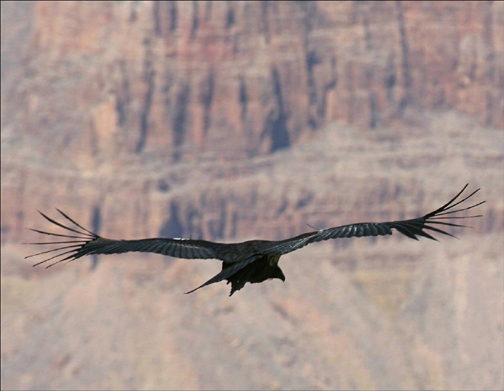 The condors in Arizona has begun producing young in the wild. Though there are still many challenges ahead, these and other efforts by The Peregrine Fund and other organizations have created a brighter future for California Condors. The public can watch a release each year, usually held the last Saturday in September. 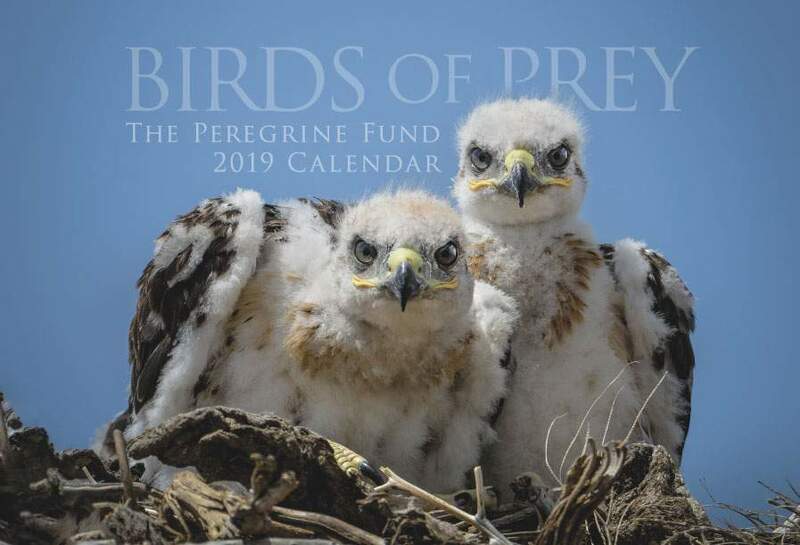 Find more information at The Peregrine Fund or Condor Cliffs on Facebook. During the Pleistocene, which began more than 250 million years ago and lasted until about 11,000 years ago, California Condors soared over parts of eastern, western, and southern North America along coastlines and in forests, mountain canyons, grasslands, and deserts. On the coast, they fed on dead seals, whales, and other marine animals that washed to shore. Inland, they likely feasted on the remains of large mammals, such as mastodons and mammoths. As these large animals, known as megafauna, began to disappear, so did California Condors. By the early 1800s, these birds could be found only along the Pacific Coast from British Columbia, Canada, down to Baja California, Mexico. By 1982, shooting, lead poisoning, and other factors had reduced the population to 22 birds, all found in California. 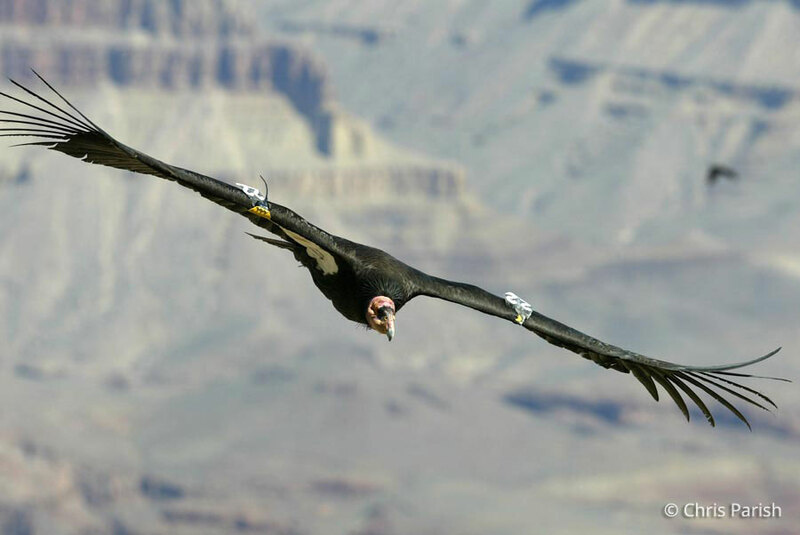 Today, thanks to efforts by The Peregrine Fund and other conservation organizations, the California Condor can be seen in parts of California, Arizona, Utah, and Baja California, Mexico. The links below provide specific location information. Best time of year: Springtime in the Grand Canyon, especially the month of May. Bring binoculars. Condors are large and easy to spot but binoculars will help you see their features while keeping your distance. Do not approach or feed condors, but do take photos and share your experience on Facebook. 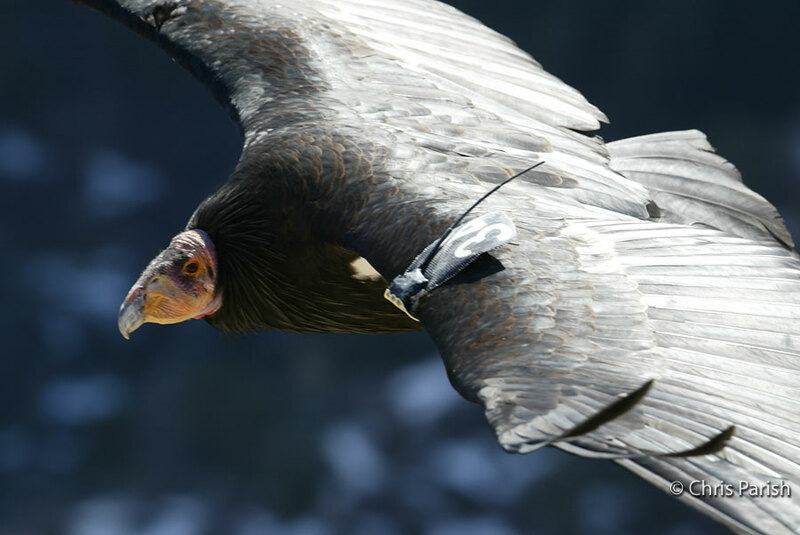 Help us keep condors wild and wary of people for their own protection. From a distance, California Condors and Turkey Vultures look similar. Both are black with red or pink heads but the pattern on the underside of their wings is different. With their wide wings, condors are perfectly designed for soaring, which means they can fly for long periods of time but only flap their wings occasionally. When you see a soaring condor, notice that the tips of its wings are pointing up. This helps with soaring by reducing drag, or air resistance. People who design airplanes have used this same feature on some airplane wings. 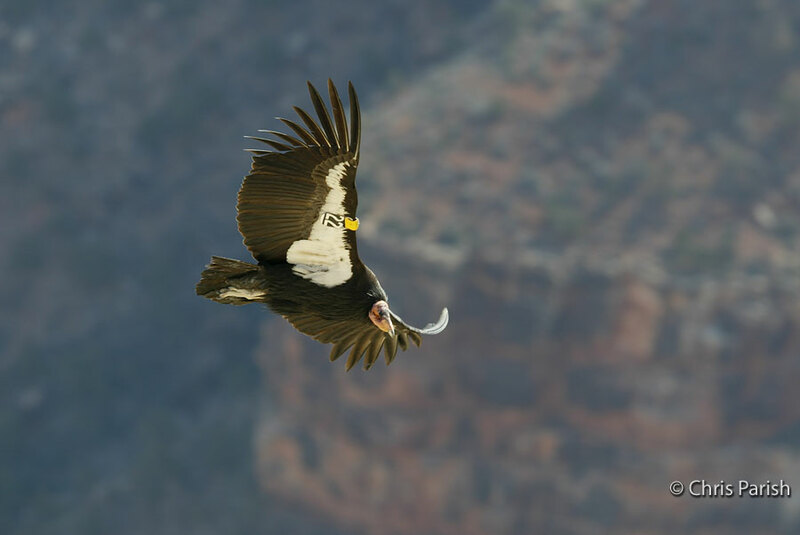 Soaring helps condors travel easily over rugged mountains, winding rivers, and forests, covering lots of ground in search of food. For us humans, such long-distance travel would take weeks or months. Condors do it in hours or days. That’s why you may find them floating over deep gorges or spreading their wings along hillsides, traveling over areas where can they take advantage of wind currents that provide good soaring conditions. The birds sleep, or roost, in tall mature trees or cliff crevasses, far away from ground predators. Condors are social birds. This means that several of them will fly, perch, or rest together. They also eat in large groups. When a condor feeds on a carcass, it may be joined by several soaring condors that, noticing the frenzy below, land and join the feast. Other scavengers, such as ravens, also hang around, hoping to get a bite. Apart from looking for food and eating, condors have other ways in which they remain safe and healthy. They often perch with their wings outspread, sunning themselves. Condors, like many birds and even humans, enjoy the feel of the warm sun on their backs. Condors spread their wings to allow the most sunlight to reach as many of their feathers as possible. They sun to stay warm and to keep their feathers healthy. When the weather becomes too hot, however, condors have a very different tactic for staying cool. When we get hot, we sweat. As the sweat evaporates, it helps keep us cool. Condors don’t sweat. Instead, they poop on their own legs! Though this might sound gross or strange to us, this is actually a very effective way for them to stay comfortable when temperatures get too high. When the poop begins to evaporate from their legs, it has a cooling effect, just like our sweat does for us. In the early 1980s, condor populations continued to decline due to shooting, lead poisoning and other factors. 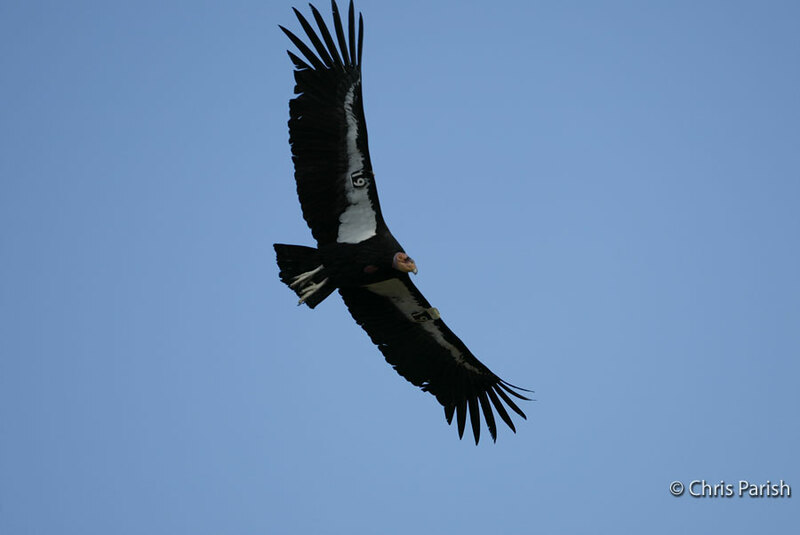 By 1982, only 22 California Condors remained. Conservationists realized that drastic measures were needed to help save the species. An intensive recovery program began. 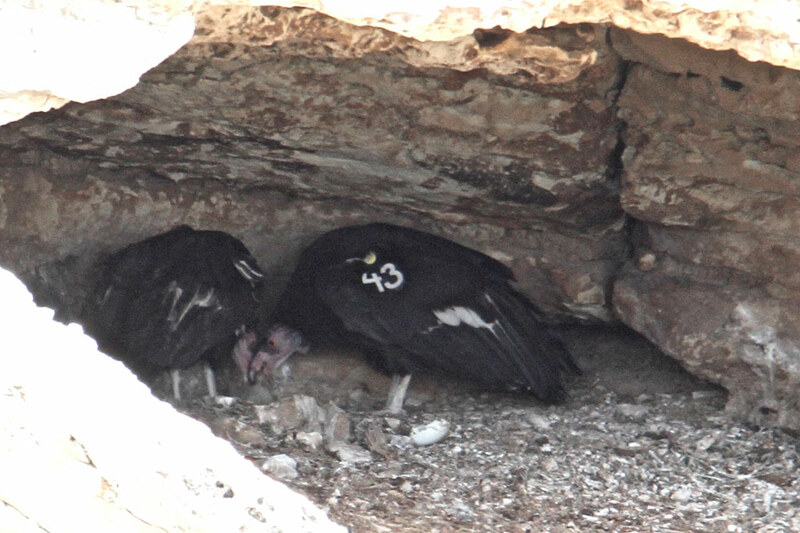 Wild chicks were removed from nests to be raised in zoos, and adult condors were trapped and brought to special facilities where they would be safe and where they could continue to produce young. At one point, every single living condor was in captivity. The first successful captive breeding of California Condors occurred in 1988 and releases into the wild began in California in 1992. The Peregrine Fund began raising California Condors at the World Center for Birds of Prey in Idaho in 1993, then releasing them to the wild near the Grand Canyon in 1996. To date, hundreds of California Condors have been released in Arizona and California in the United States and in Baja California, Mexico. Though releases and captive breeding have helped this species, the main threat to their survival is still lead poisoning. When an animal, such as a deer, is shot with a lead bullet, the bullet breaks up into tiny pieces that stay inside the animal. When condors feed on the remains of these animals, they unknowingly swallow pieces of these bullets along with their meal. The lead poisons the condors, which makes them very sick. Without treatment, many of them die. Each year condors in the Arizona flock are tested and, if necessary, treated for lead poisoning, then released back into the wild. A good way to help condors is to use bullets made of other materials, such as copper. 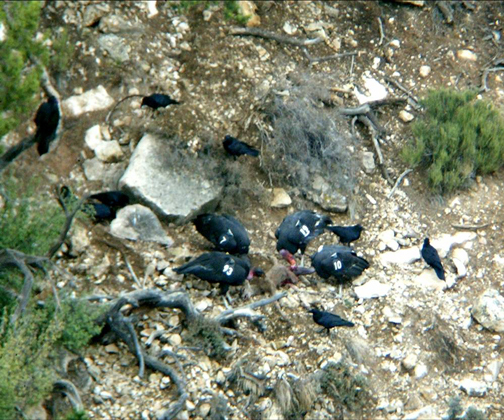 Because condors rely on dead animals for food, human hunters who use non-lead bullets can actually help condors survive by providing gut piles and other animal remains for condors to feed on. California Condors are also threatened by garbage. Because they are curious birds, they are interested in new things. 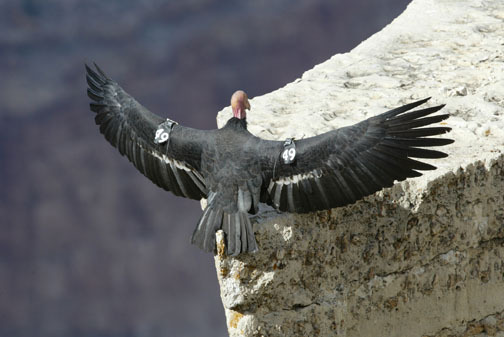 Small pieces of trash, called microtrash, such as pieces of broken glass, bottle caps, screws, and wire, can be attractive to a condor and might be mistaken for food. Some adults even bring these items back to their nests, where the chicks may accidentally swallow them. One condor in California had swallowed more than 200 pieces of microtrash! Condors can’t digest or pass these items through their system and without surgery to remove them, they will die. You can help condors and other wildlife by always putting your trash in a garbage can. Condors are carrion eaters. Carrion isn’t the bag you take with you on a plane – it means any animal that is already dead. 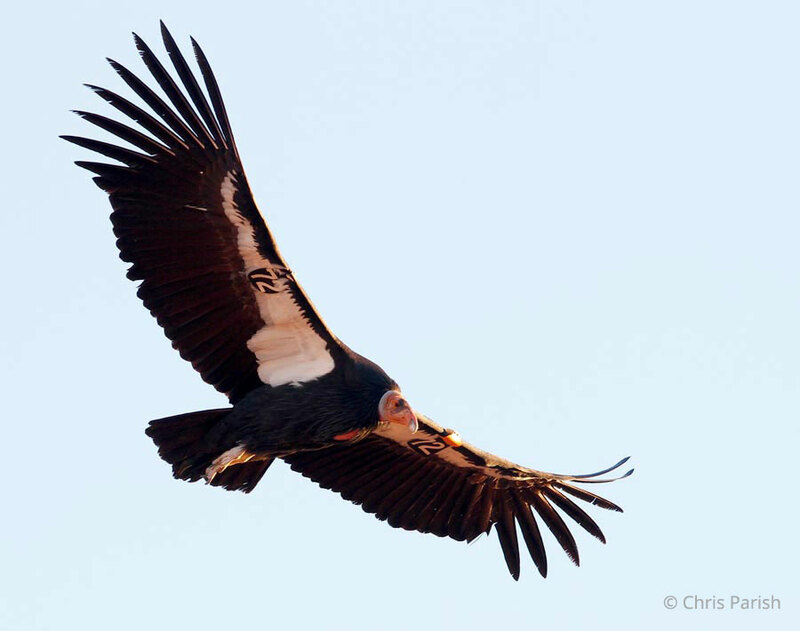 Since condors don’t hunt their food, they must travel far and wide in search of dead animals. They may make a meal out of an animal as small as a ground squirrel or as big as a cow. Some common animals on their menu include sheep, deer, elk, and horses. In their lifetimes, condors may range over millions of acres in search of food. Like all vultures, condors have very few feathers on their heads. When they eat, they sometimes put their heads deep into the cavities of rotting, stinky carcasses. If particles of this meat got deep into their feathers, they might cause bacteria or germs to grow. A bald head helps keep condors clean. When they want to, condors are able to raise the feathers around their necks to cover their heads, like we would a hood on our sweatshirt. This helps keep their heads warm during cold weather. While cliff caves are their preferred nesting sites, condors may also nest among boulders or in cavities of large trees, like redwoods. There are no twigs, branches, or other materials at the nest. The female lays her eggs directly on the floor of the cave or other surface. The parents incubate, or sit on, the eggs for almost two months before the chick hatches. Once it does, the chick grows quickly. The parents must work hard to bring it enough food so it will grow into a healthy bird. Condors can’t carry food in their feet like most raptors do. Instead, the adults store food for their young in their crop, a special pouch inside their throats where food sits before it travels to the stomach to be digested. When the adult returns to the nest, it regurgitates, or throws up, this food, which the young chick happily eats. The chick remains in the nest for about six months until it is ready to fly. Once flying, it will stay with its parents for a year or more as it learns to forage for food and survive on its own. 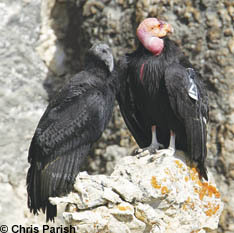 A juvenile, or young, condor has a black head. Condors become adults at 6-8 years of age and are easy to tell apart from the juveniles by their bright and colorful reddish heads. An adult pair usually produces only one chick every other year. This slow reproductive rate makes recovery of the species very challenging. 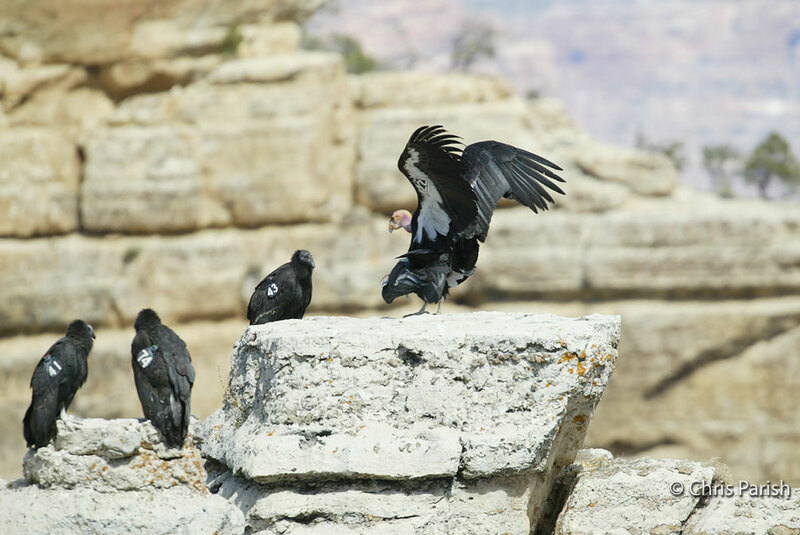 Though historically found throughout much of North America, California Condors are limited to a small range in Arizona, Utah, northern Mexico, and California. Though they are not flying free over the skies of Idaho, this state is very important for this species. 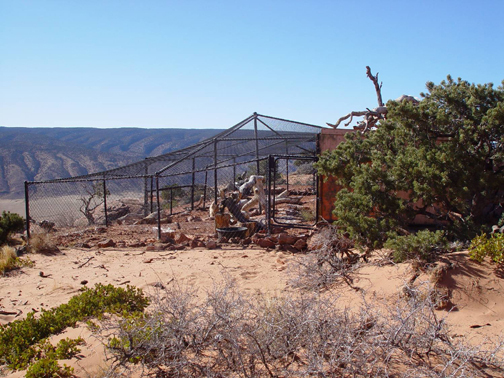 Here is where The Peregrine Fund has its captive breeding facilities, home to approximately 57 California Condors. The captive breeding facilities are closed to the public, but condors are on display at our World Center for Birds of Prey, giving visitors an opportunity to see these magnificent birds up close. 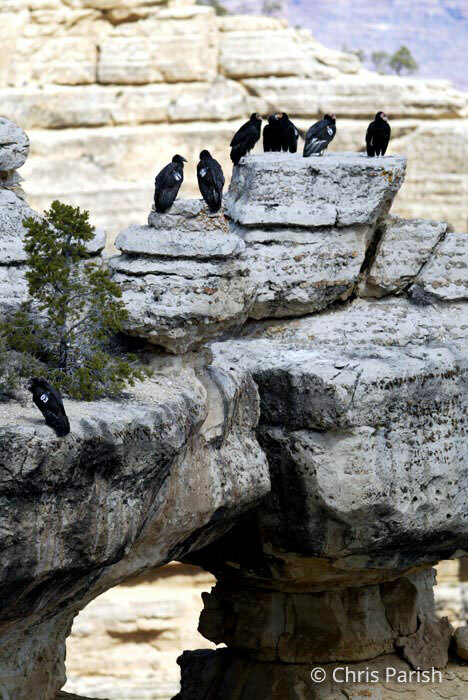 In 2010, The Peregrine Fund unveiled Condor Cliffs, a new exhibit at the World Center for Birds of Prey in Boise, Idaho. Outside of California, this is the only place to see California Condors on display in North America. Seeing a California Condor is an experience that shouldn't be missed. 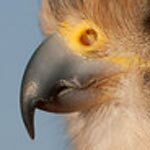 Face to face, you can see in detail the rainbow-colored heads of the adults, their powerful beaks, red eyes, and sleek feathers of outstretched wings. Man-made cliffs and live trees in the display provide the condors with a natural setting where visitors can observe them sunning, feeding, and playing in the vegetation. Interpretive signs provide information about the natural history of this species and, inside the visitor center, a short movie explains our work with this critically endangered species.